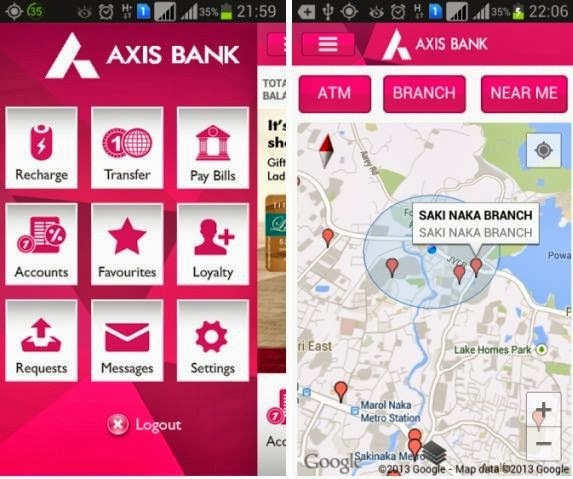 Axis Bank is one of the top private sector bank has launched its new mobile banking application version 2.0 with new features. 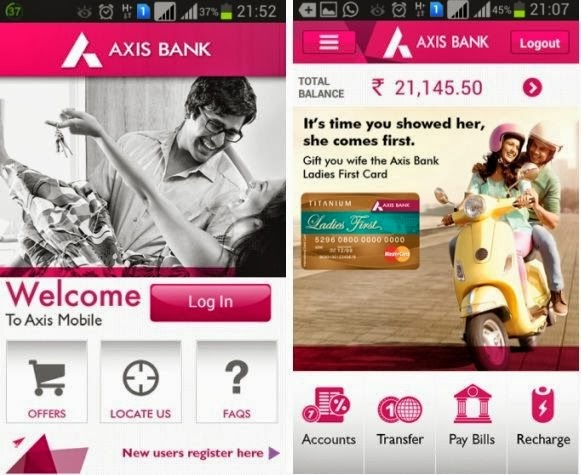 Axis bank aims to reach out to 15 lakh customers through the mobile banking by the end of 2014. Axis Mobile 2.0 version offers personalization options for users depending on the user segments including youth, premium and prime segments. The app comes with new interface that makes the user experience simple and user friendly. It lets you access savings or credit card accounts, manage transactions including account enquiry, bill payments and fund transfers from your smartphones. The app has social media integration with Facebook and Twitter where you can pull images and upload photos for beneficiaries. • View account summary, mini-statement for all your savings and credit card accounts. • View your credit card latest, unbilled and past statements. Pay your Credit Card bill online instantly. • Transfer fund (or Schedule payment) to Axis & Other Bank customers. Also transfer fund instantly 24x7 through IMPS facility. • Recharge instantly your Prepaid Mobile, Data Card and DTH. • Schedule/ Pay/ Auto-Pay your utility bills for more than 200 billers. View scheduled bills on your phone calendar. • Personalize your account details, the menu options, navigation style and beneficiary list by adding an image for them (from Facebook, phone or by taking a picture). • Request for statement of your account, cheque book, cheque status and stop payment. • View Offers for cards (credit & debit) and your Bank account. Tweet offers that you like. The app is also available for Symbian, Java and Blackberry users. If you don’t know how to register your mobile to use Axis Bank app, please click here. Nice Sharing. Going to download this app as i want this. The latest version doesn't run in NOKIA,XL..SAD.. !